If It's Hip, It's Here (Archives): Brut for Bond. 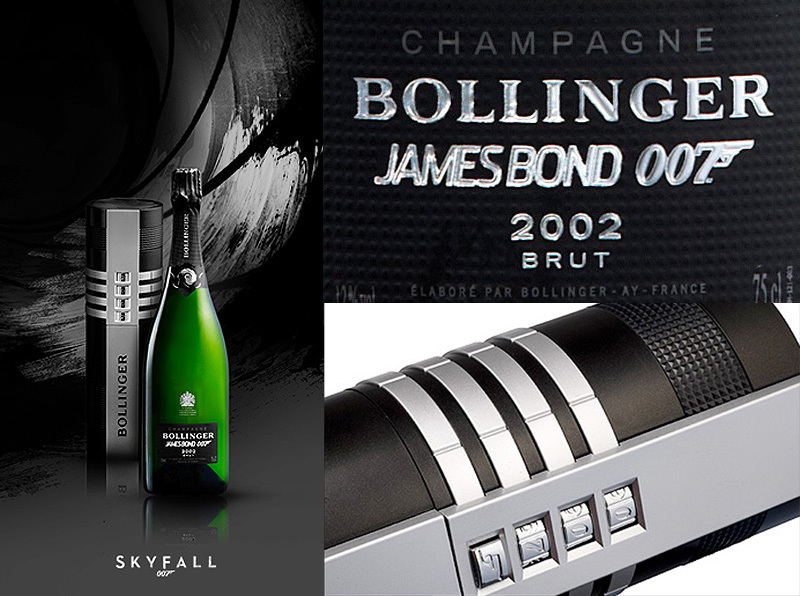 Bollinger Limited Edition Champagne 002 for 007. Brut for Bond. Bollinger Limited Edition Champagne 002 for 007. 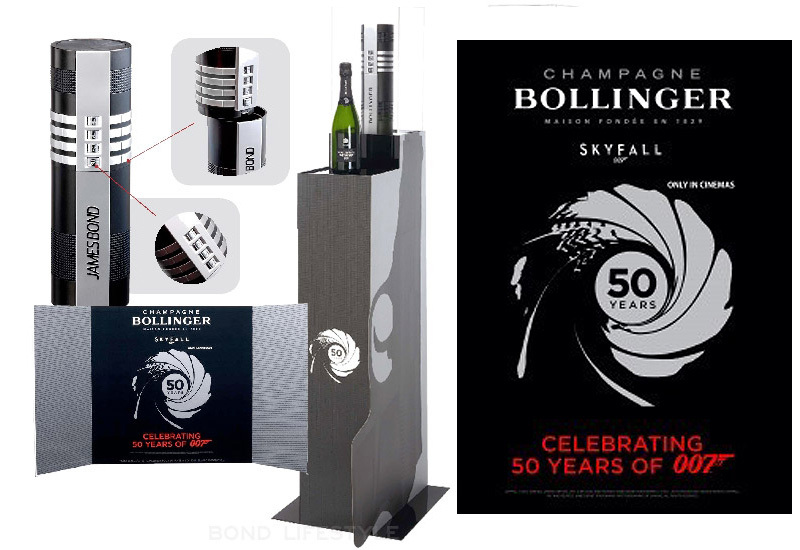 To celebrate the 50th anniversary of 007’s appearance on screen in Skyfall and the Bollinger / James Bond partnership, Champagne Bollinger has launched a limited edition special presentation box of one of their great vintages from the last century, Bollinger La Grande Année 2002. Champagne Bollinger has been Bond’s champagne of choice since its first appearance on screen in ‘Live and Let Die’ in 1973, when the Brocolli-Wilson family decided that Bollinger best represented Bond’s impeccable taste. The presentation box, in the shape of a Walther PPK silencer, opens by aligning the three numbers 007 and by clicking on the gun logo button, revealing a bottle of Bollinger La Grande Année 2002, the most exceptional vintage in the last decade, according to Mathieu Kauffmann, Cellar Master at Champagne Bollinger. 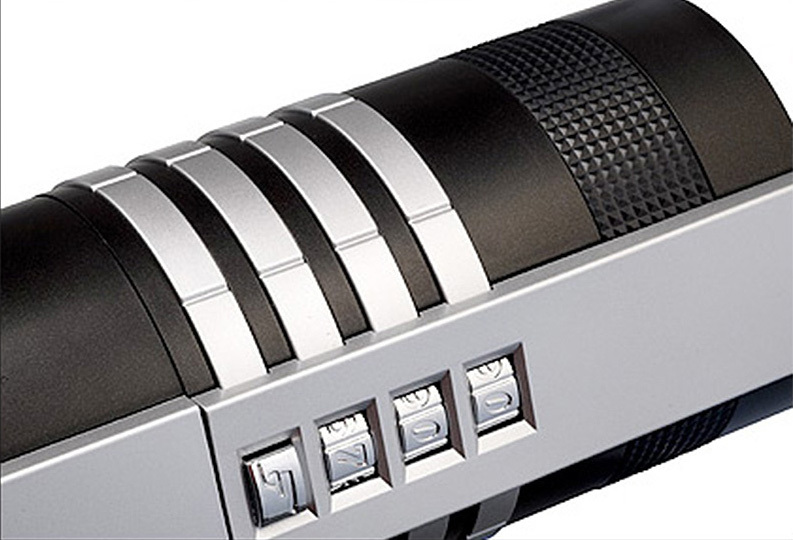 The bottle, adorned in shiny black and hot stamped silver, is a collector’s item in itself, an elegant celebration of the 50th anniversary of James Bond on screen. The guilloche pattern on the label and the cap is repeated on the box, a veiled reference to the grip of the pistol. 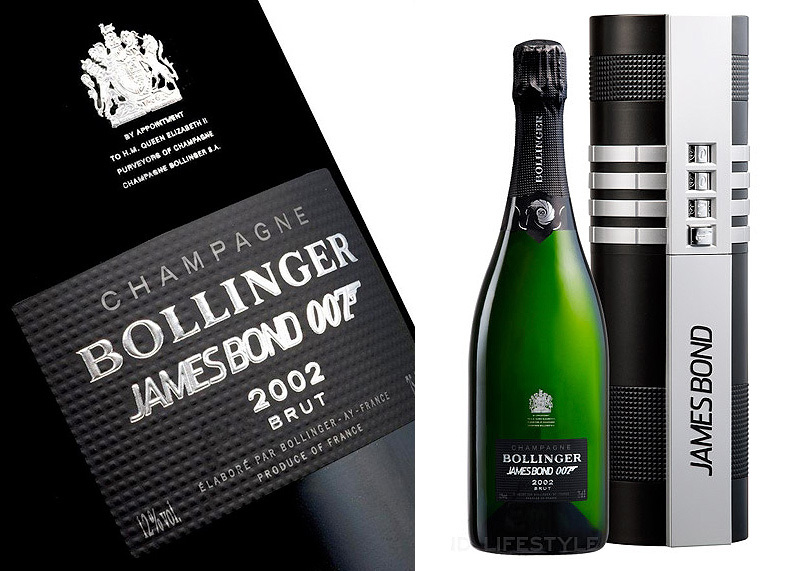 30,000 bottles of Bollinger’s 002 for 007 have been produced. Harrods of London was decked out in tribute to 007 for the whole of October. 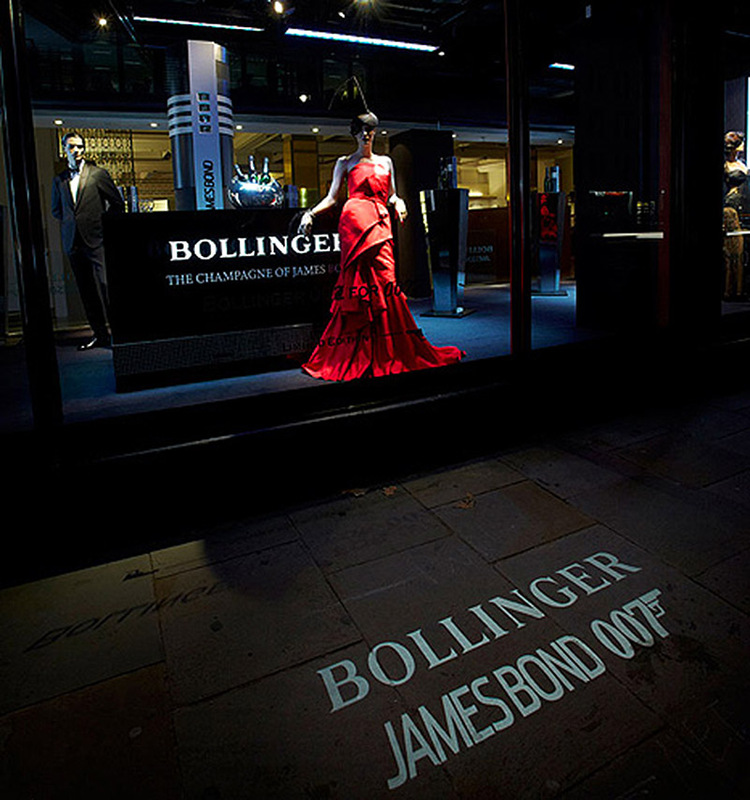 Bollinger aficionados attended a preview launch of the 002 for 007 presentation box. From escalators to store windows via tasting areas, Bond’s favourite champagne enjoys pride of place in the legendary department store. 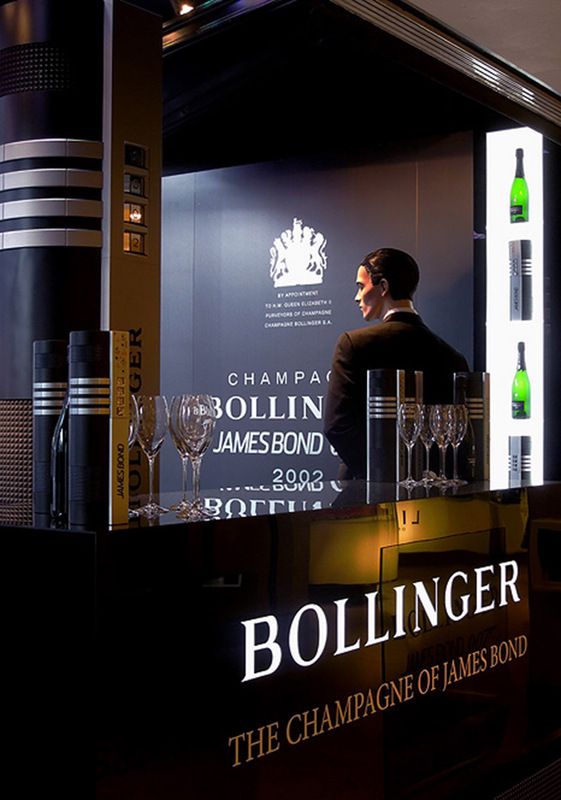 On display are bottles of Mr Bond’s favourite cuvées –including the mythical Bollinger R.D. and an outsized version of the box dedicated to the latest Bond movie. 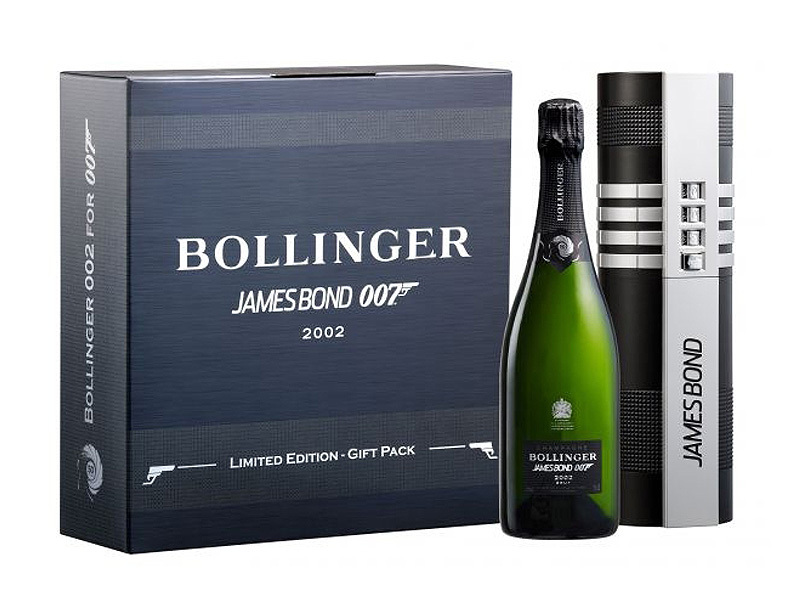 The Bollinger 002 for 007 presentation box is now for sale at Harrods.com (£150) and TheWhiskyExchange (£125), Sherry-Lehman ($199), at Zachy's ($195) and in specialist shops and wine merchants all over the globe. TheWhiskyExchange can ship to most countries in the world (price is excluding shipping costs).